In the age of Trump and Brexit, the 2018 Munich Security Conference featured a surprising new topic on the official agenda: diversity and inclusion. As the world’s most influential security experts came together to discuss the past year of security challenges and assess the outlook for 2018, the Canadian Minister of National Defense Harijt Sajjan and German State Secretary for Cyber, Policy and National Armament Katrin Suder led a discussion on "Demographic Change, Diversity and Implications for Armed Forces.” The discussion was hosted by Deutscher Soldat, a pioneering German association of soldiers of color that has been driving the debate on diversity in the German military. The conversation included high-level representatives from Israel, China, the United Kingdom, Canada, and Germany, among several other countries. A US representative was not present. The discussion outlined the significant demographic and cultural changes occurring in almost all NATO countries, from growing immigrant populations to the increasingly broad societal acceptance of LGBTQ communities. In Germany, about a fifth of the general population (and every third child) now have at least one parent that was not born German. In Canada, the percentage of visible minorities is expected to increase to about 30% by 2031. In the United States, meanwhile, it is projected that white Americans will no longer be in the majority by 2044. Already since 2011, the US population under the age of 10 is minority white. These demographic trends are accompanied by a growing push for gender equality and a new understanding and acceptance, particularly among younger generations, of LGBTQ identities. Both Sajjan and Suder argued that these changes will have far-reaching impacts on security policy and strategy. Pointing to movements like Black Lives Matter and to repeated instances of police violence against African-Americans, they noted that nations and communities feel—and are—safer when they see themselves represented in their security and police forces. But achieving representational diversity requires strategic management. Critically, both Sajjan and Suder emphasized that this new diversity-management cannot be seen as an administrative task for lower-rung security personnel, but rather as one of the most important strategic challenges facing senior leadership. As one participant noted in the ensuing discussion, the most advanced fighting machines are worthless without the right personnel to operate them. Participants also discussed the need to improve recruitment and retention strategies for a more diverse security sector. There was broad consensus about the need to improve support, networking opportunities, and leadership development for young and emerging minority leaders already working in police, military, policy, business and other security-relevant institutions. In fact, outside the conference there has been a years-long effort to create a network of young, diverse leaders in the security sector. Since 2013, the US Department of Defense, the German Marshall Fund, Deutscher Soldat, and the Heinrich Böll Foundation have helped organize biennial transatlantic conferences on diversity and inclusion in the security sector bringing together emerging security leaders from diverse backgrounds across the US and Europe. This effort continued on the sidelines of the Munich Security Conference, where Deutscher Soldat also organized a meeting of international young minority leaders in the security sector. Over 30 participants from five countries debated the current political climate, the populist pushback on diversity and inclusion, and the ensuing dangers from polarized, exclusive societies. The discussion was led by Omid Nouripour, a member of the Bundestag for the Green Party; foreign policy expert Jackson Janes, President of the American Institute for Contemporary German Studies at Johns Hopkins University; and Constanze Stelzenmüller, Bosch Senior Fellow at the Brookings Institution. As national security policymakers have begun to prioritize issues of diversity and inclusion, this initiative among the young minority leaders themselves is taking shape. The participants, many of whom have now met repeatedly in the US and Germany, committed to building a lasting transatlantic network of young minority leaders in security. They also laid the groundwork for their next meeting in Amsterdam, where the Dutch delegation has offered to host and continue this important conversation. 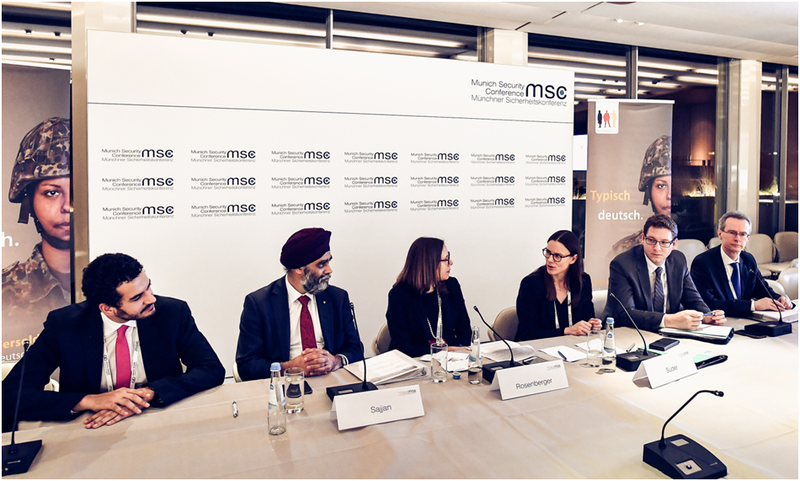 This report on diversity and inclusion efforts at the Munich Security Conference was prepared by Dominik Wullers, Spokesman for the Federal Office for Bundeswehr Equipment and Vice President of Deutscher Soldat. Find him on Twitter @wullers. Participants at the panel discussion, "Demographic Change, Diversity and Implications for Armed Forces"